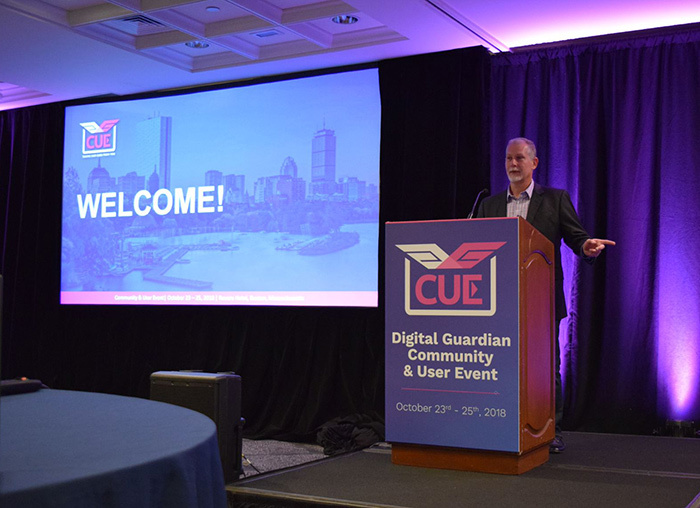 All of us at Digital Guardian couldn’t be more thrilled with every facet of last week's Community & User Event (CUE), our annual DG customer user event. Attendees heard valuable stories and gained insight around data protection strategies from experts, customers, and DG employees alike over the course of the three-day event. We'd be remiss if we didn't take this opportunity to thank all of the customers who participated and made CUE the success it was. 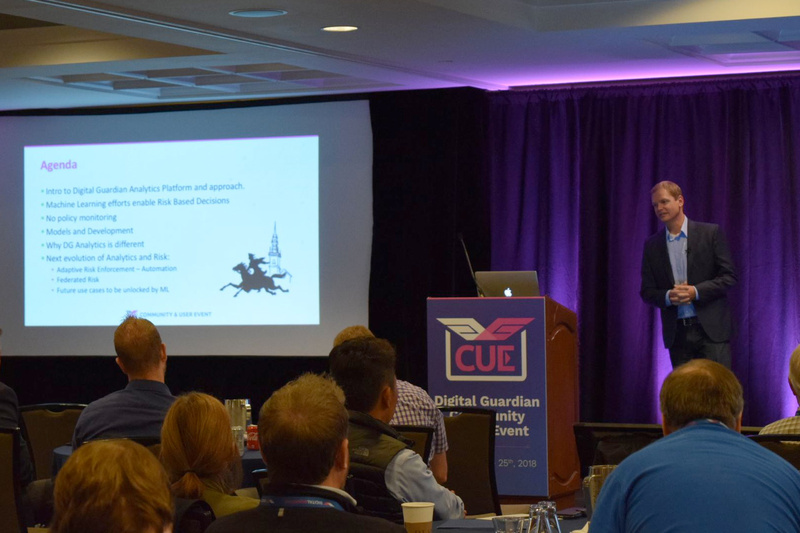 We’d like to extend our sincere gratitude to CUE’s sponsors, including Seclore, a comprehensive rights management vendor that allows organizations to track data, and Boldon James, a leading data classification and secure messaging solution. Digital Guardian has partnered with Boldon James since 2016 to make it easier for organizations to see and stop threats to sensitive data. The integration of Boldon James Classifier Foundation Suite and CAD Classifier with DG’s Data Protection Platform assists businesses in enabling user-driven data classification. 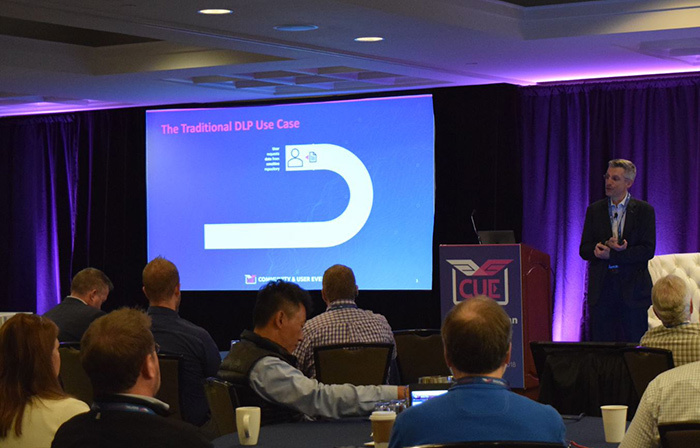 On CUE’s first day Jaimen Hoopes, our VP of Cloud Services, discussed our recent implementation of User and Entity Behavior Analytics (UEBA) capabilities for our Data Protection Platform. Jaimen broke down how UEBA can help customers better understand the risks associated with how users and systems interact with data by flagging anomalous behavior in real time. Digital Guardian's UEBA helps organizations detect and mitigate insider threats faster by prioritizing the most critical risks. Following Jaimen, Tim Bandos, our VP of Cybersecurity, explained why Digital Guardian was named a leader in Forrester's Endpoint Detection and Response Wave this past summer and how our file analytics capabilities can be used to help identify sensitive data in environments. Tony Themelis, our VP of Product Management, also demonstrated how joint DG and Microsoft customers can extend their data protection policies across all files thanks to our recent integration with Microsoft's Information Protection SDK. To close out CUE keynote speaker Brian Krebs, the prolific cybercrime investigative reporter, broke down for attendees what he called common misconceptions in cybersecurity. Krebs pointed out the ease that anyone - not just cybercriminals on the darkweb - can obtain personally identifiable information. “For the price of a caramel macchiato,” Krebs says, it’s easy to unearth individuals’ social security numbers, dates of birth, and addresses. To blame? A slew of breached, lost, or stolen credentials, something which helps fuel a lucrative market on specialized sites when it comes to selling data. “It’s shocking when you put your own email in on some of these sites,” Krebs said during his talk. Krebs isn’t immune to cybercrime, not by a longshot. The Equifax hack exposed his identity, he claimed during his talk, adding that at one point he found his own credit card information on an underground site. He considered buying it but decided against it. “Just pay attention to statements and make sure you’re not on the hook,” he reasoned. Organizations should devote time to carrying out breach response drills, Krebs said during his talk. Companies should know who needs to be involved and who doesn’t when the inevitable strikes. A crucial part of this, Krebs claims, is knowing all of an organization’s partners, and which data network sharing components are in place from partner to partner. That can go a long way with determining how exposed an organization really is. Krebs stressed in conclusion that organizations should challenge their security assumptions and pay attention, both to trusted news sources and their own internal security experts. “Organizations that have a clue know they get hacked everyday and that informs their security posture,” Krebs said. We also had several customers present their success stories and share how they're using the Digital Guardian Data Protection Platform in innovative ways to secure their most sensitive data throughout the event. We want to thank everyone who participated, both customer speakers as well as attendees. CUE would not happen without you! Greg Funaro is the Director of Corporate Communications at Digital Guardian.